Take a moment for you. Take a moment to relax . . . renew . . . replenish . . . rejuvenate. Take a moment to focus on your ideal self. At T L Spa & Wellness, we help our clients look and feel their best, so that they can give their best to the world. We are a holistic spa offering facials, waxing, acupuncture, and massage located in San Diego. We are Tyrla and Linda, a mother-daughter duo with a strong belief in supporting and nurturing women. Self-care is so important in our crazy busy world, and we know that when you take the time to pamper yourself, you are that much more able to give to those around you. We are family and every client at our spa is family, too. We give you our absolute best, with a side of friendship and authenticity. And because we consider you family, we use only natural and holistic products and treatments – nothing harsh or harmful. To read more about our background and philosophy, click here. So I know you’ve all seen the social media posts of people wearing what looks like a tanning bed for your face. I know what you’re thinking…tanning is so bad for your skin!!! But those are not tanning lights, they are LED’s, also known as light emitting diodes. 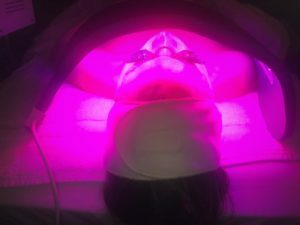 LED lights don’t contain the harmful, cancer causing UV light that tanning beds do. LED … [Read More...] about What is LED Therapy?